The badge of the 11th (Prince Albert’s Own) Hussars is the crest of the House of Saxe-Coburg-Gotha with the House’s motto Treu und Fest (True and Loyal). This badge is on the grave of 47836 Shoeing Smith Charles Anderson who is buried in the Edmonton Cemetery, Middlesex. The 11th Hussars was stationed at Aldershot in August 1914 and landed in France as part of the 1st Cavalry Brigade, Cavalry Division on 16 August. The Cavalry Division was redesignated as the 1st Cavalry Division on 16 September 1914 and the Regiment served with this formation for the rest of the war on the Western Front. 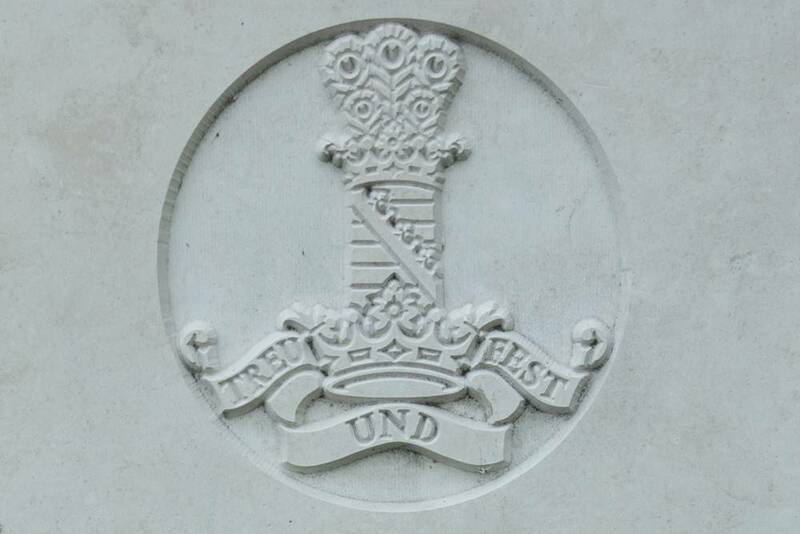 The Regiment suffered its heaviest casualties in the war at the First and Second Battle of Ypres and during the opening of the German Spring Offensive in March 1918. The best source of information for learning more about the Regiment and its role in the First World War is its war diary which I have discussed below and History of the Eleventh Hussars (Prince Albert’s Own), 1908-1934 by Capt. L. R. Lumley. 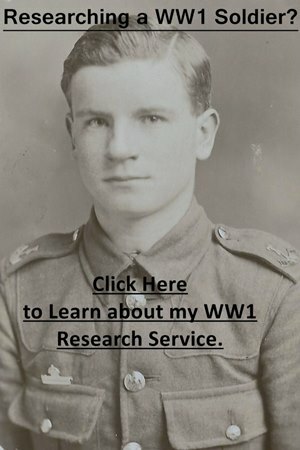 I have created a series of Guides to Researching Soldiers who Served in the British Army in the First World War which will help you to research soldiers of any regiment. The most important guides for you to start with are those looking at service and medal records and the list of British Army abbreviations and acronyms. I would recommend downloading the 11th Hussars’ war diary which I have discussed below. Officers: A service record, if one has survived, is the most important document to find and start by searching for one at the National Archives (I offer a copying service). If an officer served past April 1922 then it will still be held by the Ministry of Defence: Ordering a Service Record from the MOD. The Regiment’s war diary contains the names of some of the officers of the 11th Hussars. For promotion, details have a look in the London Gazette and Hart’s Army List. Newspapers are a good resource to use when trying to find a photograph of an officer or information regarding a casualty. The regimental history records all the officers who served with the Regiment during the war and provides a brief account of their service. 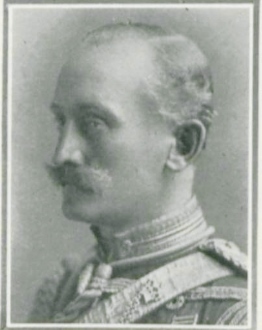 Captain John Alexander Halliday who died of wounds on 13 November 1914 and is buried in the Chicklade (All Saints) Churchyard, Wiltshire. This photograph was published in the Bond of Sacrifice, an important source to use when researching early officer casualties. Other Ranks: First have a look for a service record, though many were destroyed in the Blitz. If a soldier served past January 1921 then the Ministry of Defence will hold the record: Ordering a Service Record from the MOD. You can often work out when a soldier joined the 11th Hussars from their regimental number. The History of the Eleventh Hussars (Prince Albert’s Own), 1908-1934 contains a complete list of casualties sustained by the Regiment during the war along with the date and place they became a casualty. To research either an officer or other rank who served in the First World War, you’ll need to view the records available on both FindmyPast and Ancestry Both sites offer a free trial period and if you live in Britain you can often access them at your local library. Clicking on the banner below will take you to FindmyPast. There is only one war diary for the 11th Hussars which can be downloaded from the National Archives’ website by clicking on the blue link below. Notes: An average war diary where many of the months consist of a short summary rather than daily entries. However, the entries for 1914 are more detailed and there is a report on the attack by the 1st Cavalry Brigade at Nery on 1 September 1914. Included in the war diary for 1914 are pages from the XI Hussar Journal. There is an excellent regimental history which was published in 1936 but it is difficult to obtain as it hasn’t been reprinted: History of the Eleventh Hussars (Prince Albert’s Own), 1908-1934 by Capt. L. R. Lumley. I looked at a copy at the British Library. This book contains a readable account of the Regiment’s activities and is packed full of useful information including the locations the unit served during the war as a timeline, a complete list of battle casualties, honours, small biographies of officers, maps etc. There is also a list of soldiers who landed in France with the Regiment in August 1914 divided into squadrons. The Regiment published the XI Hussars Journal during the war with the British Library holding the October 1914 and October 1915 issues. A lot of the information was drawn from the unit’s war diary but the latter volume includes a list of casualties which recorded which squadron they served in at the time. Early on the morning of August 26th I was ordered by Lieutenant-Colonel Pitman between Catillon and Le Cateau to take my troop and get into communication with General Gough’s Brigade, to ask him for information and leave connecting files with the regiment. As I was leaving the village I met a staff officer who told me that he had come from General Gough with orders to Colonel Pitman to join him. At the outskirts of the village I was informed by the natives that a Brigade consisting chiefly of lancers had gone on the road to Bohain which I followed, having connecting files. On reaching Bohain I heard that this was the 2nd Cavalry Brigade and I joined there a detachment of 5th Dragoon Guards under Captain Norwood also looking for 1st Cavalry Brigade. I saw a message there from General De Lisle to General Gough telling him that Cavalry Division was concentrating at a town west of Bohain and saying that he was going there via Saint-Quentin. Together with party of 5th Dragoon Guards I went to Saint-Quentin, but found on arrival there that 2nd Cavalry Brigade had not passed. As horses were unable to go further we halted at Flying Corps Camp and on 27th saw a notice from Headquarters saying that all cavalry were to concentrate south of river in neighbourhood of Bretigny. Reached Bretigny on evening of 27th and late on 28th heard that a detachment of regiment under Captain Sutton was at Pontoise. I joined his party on the morning of August 29th and with them marched at 8.30 pm to join HQ of regiment at Brailly which was reached at 1.45 am on the 30th when we bivouacked and joined the regiment at 9 am on that day.